Boys Basketball – The Trojan Boys have won three games in a row including Tuesday night’s 85-68 victory over Laguna Hills in the first round of the Irvine World News Tournament. Kiron Dey led the way with 35 points including five three-pointers while Justin Wu added 17 points and nine assists. Monday night the boys beat Tamanawis High School of Vancouver 90-65. Dey had 30 points while Wu contributed 18 points and 10 assists. Last Saturday UUNI defeated Rancho Dominguez of Long Beach 89-31 at the Corona del Mar Beach Bash Tournament. Wu had 21 points to pace the Trojans. Last night our boys fell to Espranza who is ranked #8 in the county by a final of 74-59. Kiron Dey once again led the way by scoring 29 points. Justin Wu added 13. The Trojans will continue the tournament Friday and Saturday at sites TBA. Good Luck in those games boys. Girls Basketball – The Lady Trojan Basketball team opened up this week with an astounding win over Godinez in the Orangewood Academy Tournament 61-11. Outstanding performances go to Malia Goldsmith with 17 points, and Laura Nolan with 10 points but it truly was a team effort. Wednesday night our girls defeated Crean Lutheran 69-31, with great performances by Megan Cistulli with 17 points and Yasmine Choroomi with 13 points and 7 rebounds. They will take on a top ranked Mark Keppel Thursday night at orange wood academy. Good Luck Girls! Boys Soccer – Last week our boys beat Sage hill 3-0 with goals from San Kelley (2) and Milan Allister. Assists from Milan Allister, Faris Qaisi, and Sam Kelley. Our defense played extremely well to record the shut out. Ameen Shut out Behestaein led the defensive charge with solid play in goal. Last night our boys posted a fantastic win over a ranked San Juan Hills team. The final was 1-0. Faris Qaisi netted the goal and Bardia Movafagh supplied the assist. The Man of the Match according to Coach Martin was Jimmy Choi for his outstanding performance in goal. He posted several who world class saves. Congrats on the victories boys. Girls Soccer – The Lady Trojans had a rough beginning to the season, losing their first four matches against Huntington Beach, Godinez, Warren, and Laguna Hills High Schools. Then, the tables began to turn and the Lady Trojans tied two matches (Tustin and Godinez again), before hammering eight goals past Westminster in a decisive victory (8-1). Paige Metayer is a huge influence in the midfield: she either set up or scored the first four goals UNI put away this season. Emma Goolsby turned in a stellar performance against Westminster, notching 4 of those goals herself. Leyna Wood, in her debut season on Varsity, already has a couple of goals and freshman Amanda Kutcher scored her first Varsity goal on Tuesday. Leila Sedehi has emerged as a workhorse in the midfield, and the defensive duo of Michelle Maddox and Iva Petkov make scoring opportunities difficult to come by for opposing teams. The teams has a tough match tonight against San Juan Hills and are in action over the break in the North County Classic Tournament as they gear up for League Play beginning January 7th. Good luck to the team! Girls Water polo – The UNI Girls Water Polo is currently 7-5 on the season. This past Tuesday 12/15 at UNI pool, the lady Trojans beat visiting Garden Grove HS 15-8, Shawna Kedzie scored a season high 8 goals and Sophia Bajak added 3. Last weekend at the El Nino Cup hosted by Irvine HS, the UNI girls had a record of 2-2, losing in preliminary rounds to La Jolla HS and St. Lucy’s HS, and beating league rivals Woodbridge (12-6) and Northwood (6-4) the next day. This Thurs 12/17 the girls travel to Long Beach Poly HS to take on the Jackrabbits. First official league games start in January. Our own Shawna Kedzie currently ranks top 3 in Orange County for goals scored. Wrestling – On Dec. 16, Uni beat Beckman in our first league dual of the 2015-2016 season. Lead by pins from team captains Danny Gilbertson (12) at 120 lbs and Jordan Elam (12) at 170 lbs, the Trojans’ Varsity Wrestling Team snuck by the Patriots to win 36-32. Impressive wins by Alejandro Mardrid (12), Zach Taha (12) and Ethan Manniss (10) pushed the Trojans closer to a first place finish in league. The Trojans hope to keep their streak alive in the next league Dual against Northwood on 1/6. Great win wrestlers. Toy Drive – We extended our toy drive and tomorrow is the last day to bring in a toy for our Toy Drive to help the less fortunate children in Orange County. We have asked all of the head coaches to get their teams involved. Please head out to a store and pick something up and drop it off under the tree in the front office. Thanks for your support. Twitter is taking off – We launched our @UNI_Athletics twitter site last year and it took some time for it to catch on. This year alone we have had 170 new followers. If you have a Twitter account and would like updates on how our UNI athletic teams are doing, you can follow us @UNI_Athletics. It is another way to highlight our athletic teams and star performances by our athletes. University’s Trojan Army. Photo/May-Lynn Le. They are by far the most improved student section in Orange County this year. I was very impressed with them at The Fence Post game, a game that decided the city champion for Irvine. “This is a group of wild and extremely spirited students,” University Athletic Director Kevin McCaffrey said. “This year, we sold over 1,200 Trojan Army shirts. We also sold out of 625 Pink Trojan Army shirts for our Pink Out game a few weeks ago. 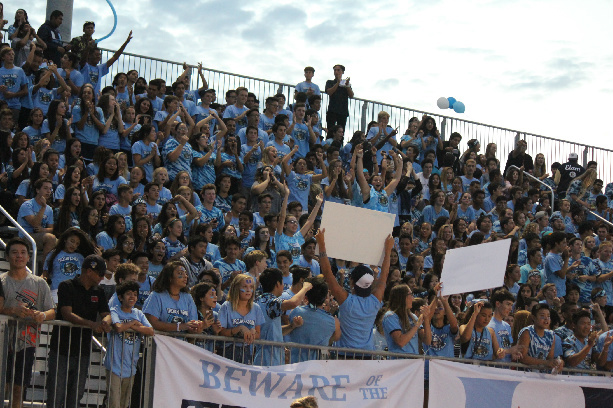 Our students are known for packing the stadium and being extremely spirited. We go over the top as far as the game day production goes.” The production of the Trojan Army is insane. They have banners everywhere, the leaders of The Army are on mic and while in the press box, we noticed members of The Trojans Army on walkie talkies making sure everything runs smoothly. They take their jobs seriously. It’s amazing. They also have the team run under a big U with the fog machine. Kind of like the Hurricanes of Miami, aka The U. They are known for running through that smoke. Boys Basketball – Our boys basketball team will continue play in the CDM tournament on Friday as they play at Costa Mesa. They will play again on Saturday at CDM. Good Luck Boys. Girls Basketball – The girls basketball team has had an explosive start to their 2015-16 season. The Varsity team opened up with an alumni game that was a huge success. Many former players came back to play and defeated the varsity team. The team played Dana Hills next and defeated them 52-43 with standout games from freshman point guard Malia Goldsmith with 17 points and Kaci Blailock added 10 points. The Lady Trojans then hosted a very competitive tournament with some of the best teams in Orange County. We walked away 2-2 losing in the 3rd place game to Woodbridge. Great games in the tournament came from senior Allison Piper and Junior Kaci Blailock. Allison was named to the All- Tournament team. They then travelled to Katella for a non-league game and defeated the Lady Knights 56-41. Strong performances by Allison Piper with 19 points, Laura Nolan with 15 points and Malia Goldsmith with 14 points. The team currently has a 4-2 record and will enter in the Orangewood Academy Tournament next week. Good Luck in your tournament girls. Boys Soccer – Our boys opened the season with a 0-0 tie v Huntington Beach. Jimmy Choi played great in goal to record the shutout. Our boys then lost late on a penalty kick 1-0 to Chino Hills. Yesterday our boys played to a 1-1 tie with Pacifica. Sam Kelley scored our lone goal and Kian Mohseni supplied the assist. Our boys are in action this afternoon as they take on Sage Hill at 3:15. Good Luck this afternoon soccer. Girls Soccer – The Lady Trojans have had a rough beginning to the season, losing their first three matches against Huntington Beach, Godinez, and Warren High Schools. The team is working through a rough patch with a number of returning Varsity players and new players injured at the moment. We are hoping a speedy recovery for them all because a full strength squad will look dynamically different. None the less, Paige Metayer has played a hand in each goal UNI has scored, knocking in one herself and setting up teammates Kiana Ghamari and Leyna Wood each for goals. Kiana Ghamari returned the favor, providing an assist for Paige as well. For Leyna Wood, it was her first Varsity goal! The Lady Trojans are in action this weekend in the Irvine Tournament, in which they placed second last season. Wish them luck and, Go Trojans!! Girls Water polo – UNI girls varsity water polo team goes into this weekend’s Irvine H.S. El Nino Cup tournament owning a current non-league 4-3 record…first game of the season was last week at home vs Ocean View High which ended in a loss…then the girls went into the Santa Ana Valley tourney last week with high energy taking a 3-2 record beating Sonora, Sunny Hills and Cypress with great team play while only losing to Valhalla and Trabuco Hills by one goal each. Tues Dec 8th the lady Trojans travelled to Laguna Hills prevailing in a 9-4 victory and posting a shut out 4th quarter. There are a lot of new faces on varsity this season including Anastasia Gomez, Michaela Boarnet, Gauvri Nathwani, Madi Wakita, Caitlyn Kissinger, Anna Campbell and Angela Yan. Returners are Molly Hudash, Shawna Kedzie, Chandlyr Denaro, Alison Huxman and Sophia Bajak. Great start to the season girls. Our girls will be back in action on Friday at the Woollett Aquatic center. Good Luck Polo! Wrestling – Our boys have been practicing hard and will compete in a tournament at Irvine HS over the weekend. Good Luck wrestlers. Toy Drive – tomorrow is the last day to bring in a toy for our Toy Drive to help the less fortunate children in Orange County. Please head out to a store and pick something up and drop it off under the tree in the front office. Thanks for your support.